The beaches of Point Reyes National Seashore are striking. I often walk these beaches in search of interesting subjects to photograph, as well as to soothe my soul, collecting trash along the way. In 3 years I have packed out on my back over three tons of trash, mostly plastic and styrofoam bits of all sizes. After a couple of years of packing 80+ pound packs of foam and boat bits off Tomales Point and the area beaches, it was suggested to me more than once that I ought to store one years’ worth of trash, then display it downtown for all to see. My response evolved into, “That is a great idea, may I store it at your place?” Always, this was met with a grin and a no-thanks. Having this exchange a few times prompted me to decide to store a year’s worth of drink bottles and display them somehow, with the hope of encouraging people to use a refillable metal bottle and stop buying plastic. The folks at Point Reyes National Seashore kindly allowed me to store my material in a park barn. I constructed what I call meta-bottles. Bottles of bottles. The contents and the caps (two-gallon buckets) are beach debris. The chicken wire was donated, then purchased when that ran out. It is all held together with, sigh, plastic tie-wraps. I tried to sew the chicken wire with found rope. It was not do-able in the manner I tried, though I plan to re-examine this for future bottles. Each bottle is 8.5 feet tall and 30 inches in diameter. The five bottles comprise roughly 172 cubic feet of mostly uncompressed plastic bottles. Intact labels show countries of origin including: Japan, China, Korea, Russia, Malaysia, Greece. A small percentage are clearly “home-grown in the US of A”. The currents of the sea bring others’ trash to us, perhaps our trash to them. The sea creatures see it all, often thinking it is food to eat. What I have learned from my many hours on the beach is that it does not so much matter how many people pick up the trash that is coming in, 24/7/365 from the sea. Myself and 1000 others could work each and every day and not keep up with the new trash arriving each day. More importantly, we all need to stop adding to the mess by making wiser, more sustainable hydration and other purchase choices. These meta-bottles show what one person can pick up on a fraction of the earth’s coastline in one short year. Imagine what is trapped in the many gyres in all the seas! The earth cannot metabolize what man keeps dumping in the sea. These bottles eventually break down and are eaten by fish, that are eaten by fish and eventually eaten by man. Please consider never buying another plastic bottle of water. Tell a friend, too! Thanks go out to Christina, Lacey, Joe, Madeleine, Gordon, Samantha, Micaela, Katrina, Sean, Katie, Jesse, Chris, Angie, Gabe, Melanie, Randy, Carissa and especially Vicki for helping me along the way. Thanks everyone! Fantastic! I pick up plastic from the shoreline of Cunninghame Arm, part of the Gippsland Lakes system here in Victoria, Australia. I’ve been doing it for about 7 months now, and have a mountain of rope, crates of plastic, not to mention the plastic bottles that I’ve been putting out in the recycle rubbish each week. Never thought to collect them – but I wouldn’t have room anyway. I have a Facebook page https://www.facebook.com/BeachGuardianJennieTowan – I’d like to use your picture with a link to your blog if that’s OK? Great work – congratulations!! Thanks for visiting and for all you are doing on your side of the planet. Please do share my thirsty image with all of your Oz friends. Hopefully some of them will start using a reusable bottle. It was great to meet you on Tomales Bay this afternoon. You collected quite a haul this afternoon. I’ve done similar trash collecting on the Estero Americano just north of Tomales Bay, but on a much smaller scale than you. I never thought to share and inspire others as you do here on your blog. I’d like to write about you on my kindergarten blog. Would it be okay to use the photo at the top of this page in my blog? Hello Fellow beach guardians! I’m from “green” Ireland (ha!) and I spend many hours like you, walking our beautiful beaches and taking home the rubbish left by others or chucked up by the sea on our mostly beautiful beaches. Once I picked up a credit card from Japan! My kids think I’m nuts and are embarrassed if I pick up rubbish when I’m with them! What gauls me most is how people just don’t care that we are spoiling our beautiful planet so rapidly. No commercial responsibility from the giants who flog the plastic in the first place and no personal responsibility from those who use up the contents and chuck the wrapper away! On holiday in Greece recently I picked 12 smallish sacs of plastic from an island beach. It was very remote and some people seemed to live there and be involved in fishing. They were contributing considerably to the mess on the beach but mostly it was, I felt, puked up by the sea! I have before and after pics! I did feel really good when the beach looked so much better! Once I had a long pub conversation about general carelessness and we entitled our discussion ” Personal responsibility 101″! Shame it never went anywhere! 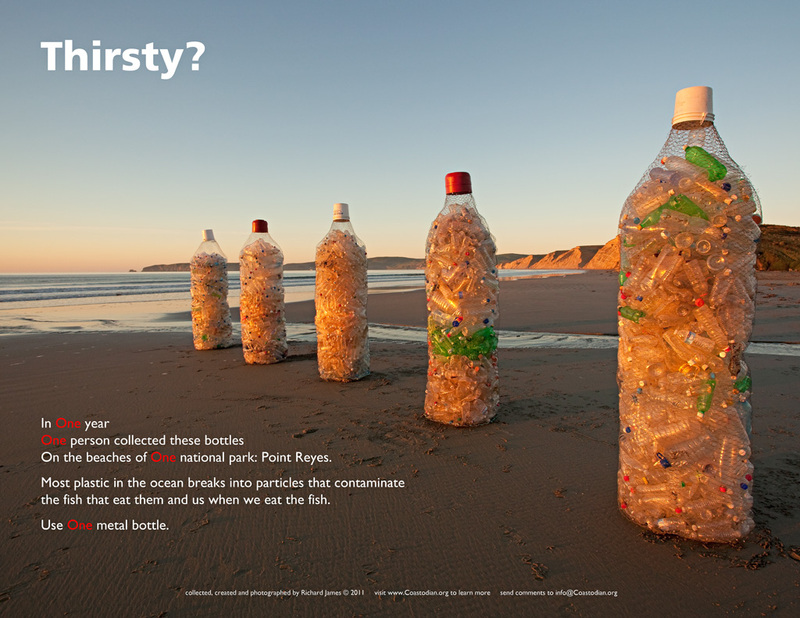 Have you seen the 19 year old on TED.COM who has come up with a solution for taking the plastic out of the gyres? Keep on picking up the plastic – if we save one bird or fish from a stomach full of plastic it has to be worth it! Good for you Richard and thank you for all you do to keep West Marin beautiful. I just read the Bay Nature article and found your website. Thank you, thank you, thank you! I was beating my brain trying to come up with something like this to raise public awareness in San Pedro, CA. There is a landslide area off of Pt Fermin here in San Pedro called Sunken City. What remains of the broken streets and foundations is now a graffiti haven. I don’t mind the graffiti. I do mind the trash. Twice a week my husband and I collect trash from the beach and the tidal pools below Sunken City. Each time out we pick up enough stuff to fill two 55 gallon drum-sized trash cans. (Thank goodness for the plastic bag ban here in LA county. The bag count is way down compared to last year.) We picked up 38 paint cans last week. It wasn’t an unusual number, it is just that we stopped to count. We picked up that many the week before and the week before. Golf balls and beer cans and beer bottles are another big problem. Sunken City is an area that the city has no obligation to clean because it is officially forbidden for people to be there. The tidal pools below are in a nature preserve so I guess no one has jurisdiction over that area either. We always forget to bring our cameras and swear we will the next time. Your site has inspired us. PS: We’ve carried out an office chair, lawn chairs, bbq grills, medical marijuana vials, countless socks, shoes, undies and used diapers, straws and plastic straw slips galore, etc … I even found a fast food soft drink cup with ice in it. There were only two other people out there and they were heading home. hello richard, i, too, collect debris when at the beach–but you are an inspiration to do more. thank you for your efforts on behalf of our home. Hello Richard, I live in the south of Brazil and also collect lots of plastic, bottles, old ropes, styrofoam ¨& other trash from our shores. The situation here is not much better. Sorry for our world. I keep collecting because it just makes me feel a little better. I also throw seed bombs in areas where the vegetation has been cut. Keep the good works. Thank you for stopping by, reading and your comments. A big thank you for your efforts on your local beaches. The more people we can get to the beach to see the mess we are making of our planet, the better. We need to show everyone that small efforts, on a global scale CAN make a difference. Send me pictures of what you are finding and I will post them here. If you have a presence on the net, send me a link and I will share it in the US. Bravo and thank you Claudia. I read about your beach clean-up efforts in a recent issue of Bay Nature. Definitely one of the most inspirational stories I’ve read from that fine publication. Keep up the good work and don’t get discouraged! The world is better place with people like you around. Thank you for your kind words of encouragement. They are timely, as I am down a bit lately, given all the trash I see on a daily basis in the bay area. People just don’t seem to care. And here it is August and many, many people are still pushing ski racks through the atmosphere wherever they drive their already wasteful SUV’s, too lazy to remove them, wasting thousands of gallons of gas, pumping ever more CO2 into our fragile atmosphere. My efforts feel more Sisyphean than ever. Richard, thanks so much for your great work! As a resident of West Marin and one who makes a living on the water as a kayaking and sailing guide I really appreciate your concern for the area. I don’t collect anywhere near as much trash and debris as you do but I try to do my part when I can, usually by helping to collect the boats which seem to break lose from moorings and docks every winter. Just the other day we pulled a 25ft, 3500lb derelict sailboat off of the rocks just north of Inverness preventing it from breaking up and spilling its fuel tanks. Unfortunately the current mooring rules (or lack of them) in Tomales Bay allow some people to neglect their boats to the point where they break loose and can end up on beaches (we had 5 break loose and an additional 2 sink this winter alone). I also wanted to address the whole “oysters clean the water” issue. This is something that keeps coming up again and again. While it is true that a heavily polluted and relatively enclosed waterway can be cleaned by stocking it with large numbers of oysters (you wouldn’t like to eat them), this phenomenon has practically no applicability to Drake’s Estero, which is nearly completely flushed twice a day by the tide. People that say water quality is going to suffer for the lack of oyster farming in the estero don’t seem to understand how this waterway works (i.e. the oyster farming was there because of the good water quality, not the other way around). Hi Richard, It’s Moon, You are doing great job, I can not reach worthy job like you and just admire you.